“Whatever they’re doing has really worked for them,” said David Gold, an assistant professor of paleobiology in the UC Davis College of Letters and Science. The first in-depth look at the genome of a jellyfish—the moon jelly Aurelia aurita—reveals the origins of this successful survival strategy. The Aurelia genome, published online Dec. 3 in the journal Nature Ecology and Evolution and co-led by scientists at the University of California San Diego, indicates early jellyfish recycled existing genes to morph from polyp to medusa. The results suggest animals can radiate into new niches and forms fairly easily. The research team was led equally by Gold, who performed much of the work as a postdoctoral fellow at the California Institute of Technology, and by Takeo Katsuki, a former project scientist at the Kavli Institute for Brain and Mind at UC San Diego and currently an application specialist at Thorlabs Japan Inc.
“Jellyfish are important both evolutionarily and environmentally, so having their genome sequence establishes their study as a key addition to what we know about their biology,” said Ralph Greenspan, a professor in the UC San Diego Division of Biological Sciences’ Section of Neurobiology and associate director of the Kavli Institute for Brain and Mind, who also led the study. Moon jellies at Birch Aquarium at Scripps Institution of Oceanography, UC San Diego. At some point in their evolution, jellyfish gained the ability to transition from a stationary polyp to a swimming medusa. The transition involves major changes in the jellyfish nervous system, muscles and weaponry, aka the stinging cells called cnidocytes. To accomplish this, the medusa life stage often co-opts existing developmental gene networks and cell types present in polyps, the researchers found. In addition, Aurelia appears to pattern its different life stages using many of the same genes found in animals such as fruit flies and humans, the study reports (all of these animals share a common ancestor, albeit an ancient one). There is a second, more controversial explanation for what the scientists found in the jellyfish genome. 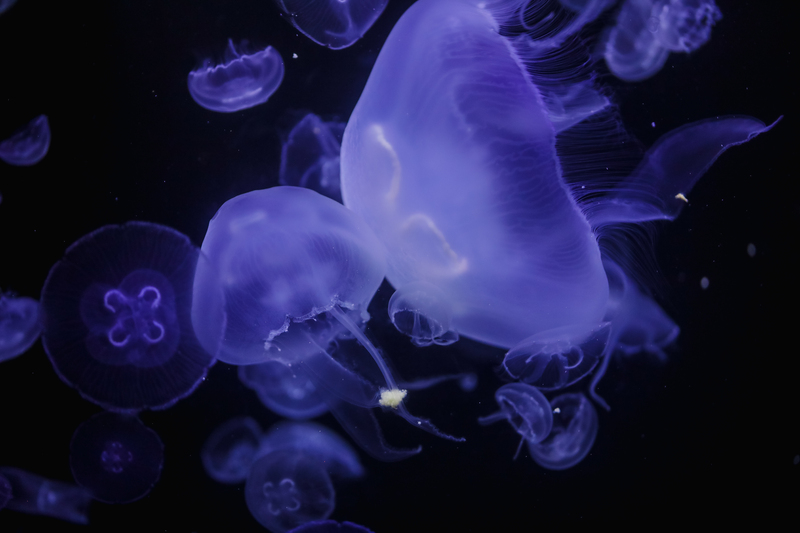 Perhaps the similarities between the moon jellyfish genome and “higher” animals demonstrates that the Cnidaria originally had a medusa life stage, which animals like corals and sea anemones lost. Additional authors on the paper are: Yang Li and Xifeng Yan, UC Santa Barbara; Michael Regulski, Cold Spring Harbor Laboratory, New York; David Ibberson and Thomas Holstein, Heidelberg University, Heidelberg, Germany; Robert Steele, UC Irvine; and David Jacobs, UCLA.